Ketchup, Brown Sugar, Molasses, Worcestershire Sauce, Mustard, Salt, Liquid Smoke Flavor, Paprika. 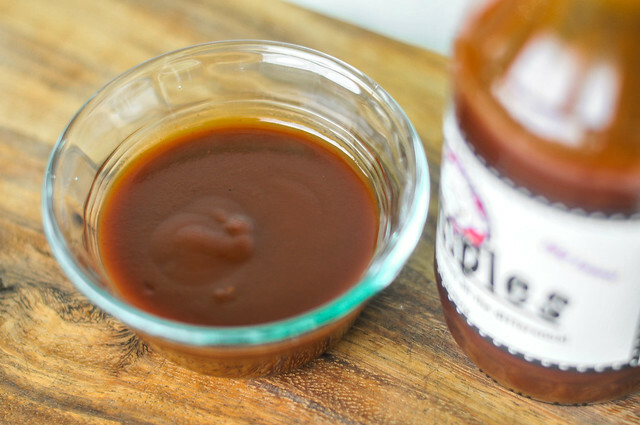 A well-balance and uncomplicated standard barbecue sauce, Dimples may not stand out in a crowd, but it'll consistently deliver a flavor that will be universally crowd pleasing. Rich Campana, creator of Dimples, was kind enough to send me this sauce for review. Rich traces his barbecue roots back to Chicago, where he grew up on sweet sauced 'cue. 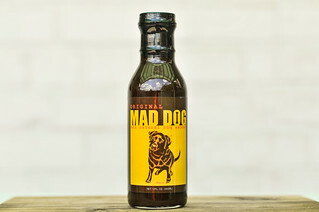 He used that background to develop Dimples BBQ Sauce—named for a Campana family trait of dimpled chins—with a sweet taste of his home and vinegary nod to his current home base of North Carolina. 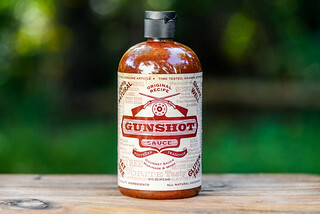 Working out of Raleigh, Rich made the sauce official in January of 2011 when we started selling his sweet and tangy sauce. Dimples has an ubiquitous barbecue sauce aroma that just about anyone would find familiar. There's the sweet ketchup with a nice tanginess, then some heavy Worcestershire and an underlying mustard that adds a slight sharpness. It's all well balanced and easy on the nose. This is an incredibly smooth sauce, with no real discernible spices or chunks to break up it's solid maroon color or fine texture. It weighs in right in the middle of the thickness scale, and flows in a steady, continuous stream off of a suspended spoon. Dimples has a very smooth, very standard barbecue sauce flavor. It starts off pretty sweet and strongly ketchup. The vinegar quickly comes in and adds a little bite, but never really interrupts the sweetness. As the sauce settles on the tongue, Worcestershire adds some depth and there's also a light molasses flavor. No heat ever makes an appearance, leaving a mainly sweet and tangy flavor. The sauce coated the chicken well, but never baked in great and then suffered some burn off over direct heat. I had to add an extra coat of sauce at the end to cover the chicken. This made for a sticky chicken leg that had the flavor of extra sweet ketchup. With more sweetness coming out after cooked, the tang and depth out of the jar was diminished, making it a sugary affair. 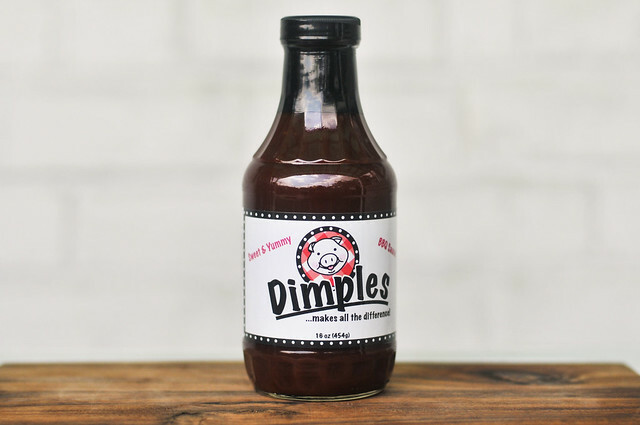 Dimples is a nicely balanced, uncomplicated standard barbecue sauce. It hits the sweet and tangy notes well, but also doesn't go much beyond that. While it may not stick out in a crowd, it'll consistently deliver a flavor that will be universally crowd pleasing. 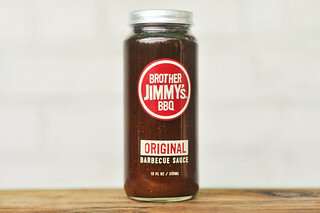 I would recommend this for those looking for a classic barbecue sauce flavor, especially if being used as a condiment—the sauce had more layers of flavor out of the jar and veered more to the overly sweet side after cooked. I can imagine this being a great sauce for burgers, where a juiced-up ketchup would be a nice change of pace, but not diverting too much from a familiar and loved classic. Meatwavers, give a big thanks to Rich Campana for not only sending me a bottle of Dimples to review, but also an extra one just to giveaway to you! To enter the giveaway, comment on this post with your favorite fall item to grill. Deadline for entries is 11:59pm on Tuesday July 24, 2012. Read the official rules for more details. One entry only per individual. Good luck! My favorite item to grill has to be a nice big juicy chicken! And if I had Dimples BBQ sauce, my mouth would be in all kinds of heaven! Favorite fall item to grill is pork, either a whole tenderloin or chops, along with some apples for dessert. Using a sweet sauce like Dimple's on the pork would pair well with the sweetness of the apples. 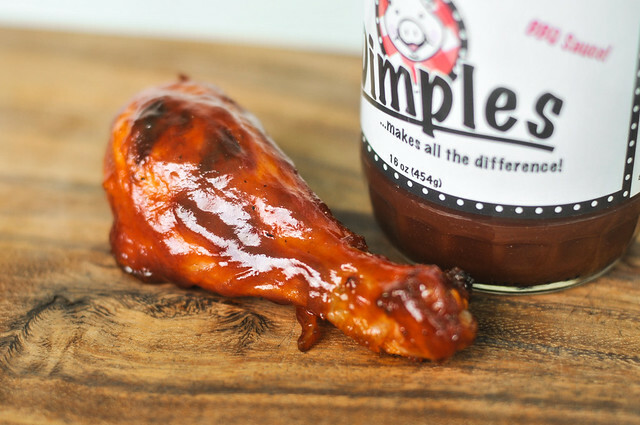 I got the opportunity to review Dimples for BBQ Sauce Reviews - I like this sauce ! Good review Josh. My favorite food to grill in the fall is Steak. My favorite thing to grill in the fall is brats and burgers before cooling the grill down and throwing butts on for an overnight smoke. My favorite thing to grill is whole chicken. Nothing like some smoked chicken noodle soup. I would love to try this on chicken my favorite item to grill. This giveaway has ended, congrats to Phillip on winning!